You wouldn't know it from the media coverage, but peaceful protests are nothing new for Palestinians. But if they are to succeed this time, the West needs to start paying attention. Last weekend, as tens of thousands of unarmed refugees marched toward Israel from all sides in a symbolic effort to reclaim their right of return, the world suddenly discovered the power of Palestinian nonviolence. Much like the "Freedom Flotilla," when nine activists were killed during an act of nonviolent international disobedience almost a year ago, the deaths of unarmed protesters at the hands of Israeli soldiers drew the world’s attention to Palestine and the refugee issue. The world shouldn’t have been so surprised. The truth is that there is a long, rich history of nonviolent Palestinian resistance dating back well before 1948, when the state of Israel was established atop a depopulated Palestine. It has just never captured the world’s attention the way violent acts have. Indeed, by the issuance of the Balfour Declaration in 1917, well before the establishment of the state of Israel, and during a period when the Jewish population of historic Palestine had yet to reach 10 percent, the native Arabs of Palestine could already see that their hopes for self-determination — in a homeland where they constituted a vast majority — were being jeopardized by their soon-to-be colonial master. Resistance to Zionism during this period was characterized by various efforts led by elite members of Arab society who raised awareness about the dangers Zionism posed. Just before the war, Palestine saw a huge spike in new newspapers, and writers and editors such as Ruhi al-Khalidi, Najib Nassar, and Isa al-Isa regularly zeroed in on the threat of Zionism to Palestinian life. Diplomatic efforts to lobby the mandatory government ensued while concurrently peasants occasionally clashed with the European newcomers, but violence was largely localized and communal and took place amid larger, more peaceful, and political efforts to resist Zionist aims. As Jewish immigration into Palestine increased and the implementation of the Balfour Declaration became more apparent, Palestinians who feared marginalization (or worse) under a Jewish state continued to resist. In the early 1930s, numerous protests and demonstrations against the Zionist agenda were held, and the British mandatory government was swift to crack down. 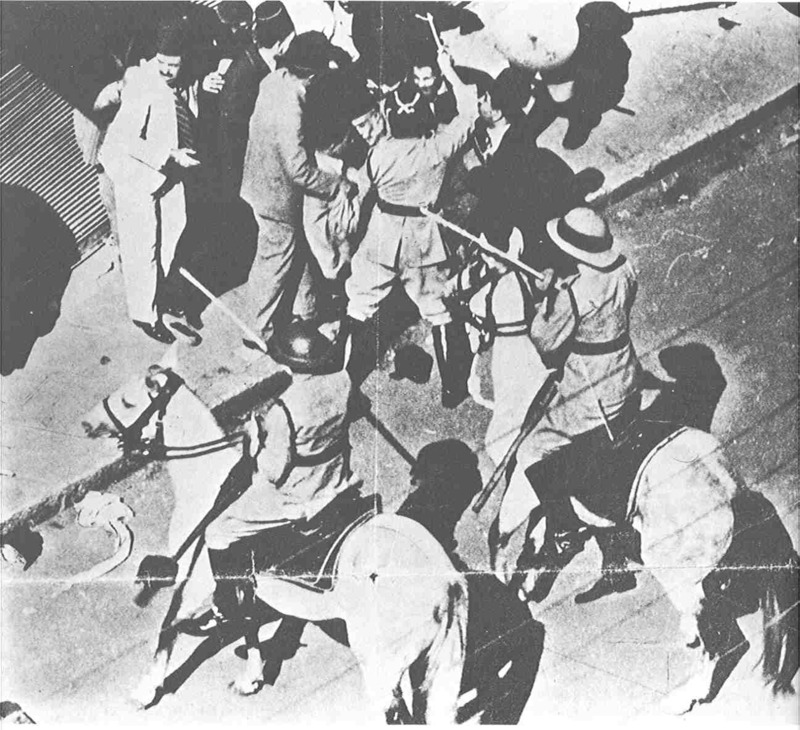 The iconic image of Palestinian notable Musa Kazim al-Husseini being beaten down during a protest in 1933 by mounted British soldiers comes to mind. It wasn’t until nonviolent protests were met with severe repression that Palestinian guerrilla movements began. After the 81-year-old Husseini died a few months after being beaten, a young imam living in Haifa named Sheikh Izz ad-Din al-Qassam (the namesake of Hamas’s military wing) organized the first militant operation against the British mandatory government. His death in battle with British soldiers sparked the Arab rebellion that began in 1936 and lasted until 1939. The first phases of this revolt began with nonviolent resistance in the form of more strikes and protests, and the economy ground to a halt for six months when Palestinian leaders called for a work stoppage. This was put down harshly by the mandatory government, according to British historian Matthew Hughes, including the bombing of more than 200 buildings in Jaffa on June 16, 1936. The repression of both violent and nonviolent Palestinian dissent significantly destroyed the capacity of Palestinian society, paving the way for the depopulation of Palestine and the establishment of the state of Israel a decade later. During the Nakba, which is what Palestinians call the period of depopulation from 1947 to 1949, nonviolent resistance became harder to see again, as armed conflict and violence dominated headlines. But one anecdote, which hits close to home, suggests that thinking about nonviolent resistance in the Palestinian context requires broadening our conventional understanding of the concept. My hometown, Al-Lyd, (which is today called Lod), was besieged by Haganah troops in mid-July 1948. As part of Operation Dani, Al-Lyd and the neighboring town of Ramla were depopulated of tens of thousands of Palestinians. At the time, the city was filled with at least 50,000 people, more than twice its usual population, because it had swelled with refugees from nearby villages. After the siege, my grandparents were among the 1,000 original inhabitants who remained. They and many others refused to flee during the fighting and hid in the city’s churches and mosques. Unlike their neighbors, who were hiding in the Dahmash mosque where scores of refugees were massacred by Haganah troops, they managed to survive and walk out of their refuge into the destroyed ghost town they called home. We tend to think of nonviolent resistance as an active rather than passive concept. In reality, even though the majority of the native inhabitants were depopulated during the Nakba, thousands of Palestinians practiced nonviolent resistance by refusing to leave their homes when threatened. Today, through its occupation, Israel continues to make life unbearable for Palestinians, but millions resist the pressure by not leaving. This is particularly notable in occupied Jerusalem, where Palestinians are being pushed out of the city. For those who have never lived in a system of violence like the Israeli occupation, it is hard to understand how simply not going anywhere constitutes resistance, but when the objective of your oppressor is to get you to leave your land, staying put is part of the daily struggle. In this sense, every Palestinian living under the Israeli occupation is a nonviolent resister. The first and second intifadas were very different. In the first intifada of the late 1980s, Palestinians employed various nonviolent tactics, from mass demonstrations to strikes to protests. Even though the vast majority of the activism was nonviolent, it is the mostly symbolic stone-throwing that many remember. The Israeli response to the uprising was brutal. In the words of Yitzhak Rabin, then the Israeli defense minister, the policy was "might, power, and beatings" — what became known as the "break the bones" strategy, depicted in this gruesome video. Mass arrests also ensued, and according to the NGO B’Tselem more than a thousand Palestinians civilians were killed from 1987 to 1993. Thousands more were injured or crippled at the hands of Israeli troops. Yet, only 12 of the 70,000 Israeli soldiers regularly posted in occupied territories during the intifada died in the four-year uprising, clearly demonstrating the restraint with which Palestinian dissent was carried out. The second intifada, which began in 2000 after a decade of negotiations yielded only more Israeli settlements, violence was used much more readily, including armed attacks. Yet while the acts of violence by both sides were more likely to feature in the headlines, many Palestinians were still employing nonviolent means of resistance; protests and marches, many at nearly daily funerals, were commonplace. It is during this period that the seeds of present-day nonviolent resistance in Palestine were planted. Before we can think about whether nonviolent resistance is likely to factor heavily in the next chapter of the Palestinian struggle, we must first consider its aims. Nonviolent resistance, like armed resistance, is a tactic or tool primarily used to draw attention to a cause. The difference between the two is, of course, more important than the similarities. While armed resistance is likely to draw more attention to a cause by grabbing headlines, it’s also likely to bring with it plenty of negative attention. Nonviolent resistance is far less likely to make it into the international news, though when it does get coverage, it’s usually overwhelmingly positive. But a strategy of nonviolence only works if the world is paying attention and rewarding nonviolence with meaningful action. The atmosphere in the Middle East and North Africa today is electric. Thanks to the scenes of peaceful protesters ousting dictators in Tunisia and Egypt, belief in nonviolent people power is at an all-time high. But for Palestinians to continue making the same decision, they have to believe they will succeed. If nonviolent Palestinian protesters are crushed by force and their repression is met with silence from the Western states that support Israel, many might choose an alternate path. That’s why the U.S. response to the Nakba Day protests — pointing the finger at Syria instead of criticizing Israel for shooting unarmed demonstrators — is so disappointing. If ever there were a moment for Palestinians to overwhelmingly embrace nonviolence, that moment is now. The new media environment has created space for peaceful Palestinian voices that would never have been heard in the past. Many nonviolent protests continue to take place regularly: from the aid flotillas and convoys, along with repeated demonstrations against buffer zones in Gaza, to protests against the separation wall in Bilin, Nilin, Nabi Saleh, and al-Walaja; to demonstrations against home eviction and demolition in Jerusalem neighborhoods like Sheikh Jarrah and Silwan; to regular marches in refugee camps inside and outside of Palestine. But Western governments need to end their silence. By condemning Palestinian violent resistance while failing to condemn Israel’s repression of nonviolent resistance, Israel’s allies — above all the United States — are sending the dangerous message to young Palestinians that no resistance to Israeli occupation is ever acceptable. The fact that the nonviolent protest of the Arab Spring has come to Palestine is not a threat. It’s a historic opportunity for the West to finally get it right.